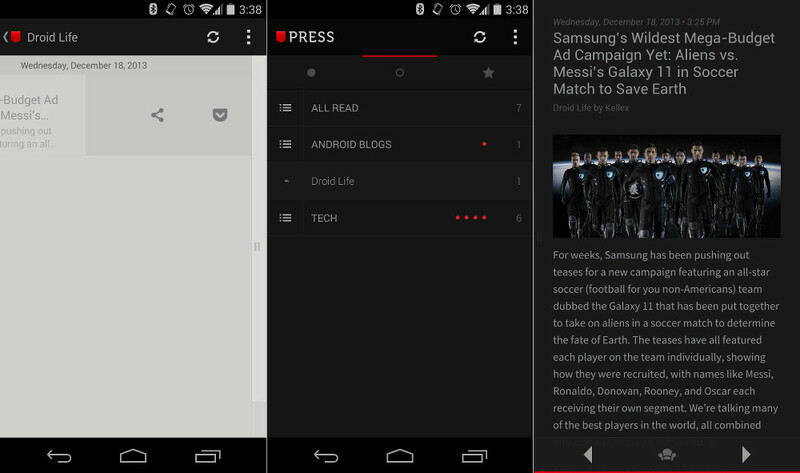 Press, one of our favorite RSS readers of all time, received a massive or “huge” update tonight to version 1.5. For those not familiar, Press was introduced around the time that Google decided to kill off Google Reader, however, it survived thanks to RSS services like Feedly. It’s both beautifully designed with Android design guidelines, has been buttery smooth for ages, and continues to see enhancements with each update – tonight’s being the perfect example. After the update, users will find an optional dark or “night” theme to help save you from the blinding brightness that is your phone at early morning hours. The update also features one-tap saving to Pocket or Instapaper, plus new gestures for starring items, sharing, and marking as read. If you are on Kit Kat (Android 4.4), you will be able to take advantage of Immersive Mode while reading articles (toggle on in Settings>Reading) as well.